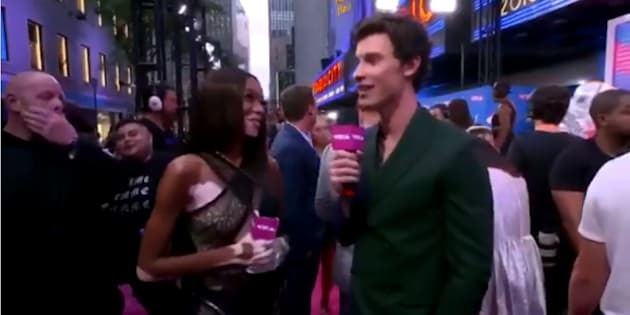 Winnie Harlow and Shawn Mendes represent Canada on the 2018 MTV VMAs pink carpet. Slaying in silver! Winnie Harlow sure knows how to stand out on the 2018 MTV VMA pink carpet, and she's upping her style game as the event's official fashion correspondent on Monday. The Canadian model last attended the music awards show back in 2016, as part of Beyoncé's "Lemonade" troupe. However, this time around, she's taking a sartorial cue from Queen Bey for her big role, opting for two looks: one for the red carpet, and one for her latest gig, co-hosting a Twitter and broadcast VMAs pre-show. In fact, her long-sleeved jewel-encrusted silver Zuhair Murad gown bears quite a resemblance to what Beyoncé wore two years ago. "This was actually my dream before modelling," said Harlow, about her new reporting gig, in a behind-the-scenes fashion video posted to MTV's YouTube channel. "I actually wanted to be an entertainment journalist." "I will be talking about the styles we're seeing on the red carpet. I'm really excited about it!" Winnie Harlow attends the 2018 MTV Video Music Awards at Radio City Music Hall on Aug. 20, 2018 in New York City. And her style is just as worthy of discussion as the others she's gearing up to highlight. Harlow's first VMA dress comes complete with strategically-placed crystal tassels to cover the dress' sheer panels, keyhole neckline and slit down the middle. Before she chatted with the stars, Harlow kept her keyhole style going, and changed into a black-and-white cross-body halter see-through dress with mesh details, and gold accents. Canadian model Winnie Harlow attends the 2018 MTV Video Music Awards at Radio City Music Hall on Aug. 20, 2018 in New York City. "My perfect night for the VMAs would be me not tripping," joked Harlow before the pink carpet. "And that's it. That's the criteria." Harlow, who hails from Mississauga, Ont., turned 24 last month, and got to kick off her evening by interviewing a fellow Canadian, Shawn Mendes. "Where are you from again?" asked Harlow on the pink carpet. "Canada!" replied Mendes. "Where are you from again?" "Canada! Just wanted to throw that in there," Harlow joked to Mendes on the pink carpet, about their shared homeland connection. Mendes is nominated for three MTV Video Music Awards — including Best Pop Video — for his hit single, "In My Blood." He performed the song while looking very much like Bryan Adams in a sleeveless white shirt and slacks. Earlier in the night, the Pickering, Ont. native came dressed for the occasion in a two-toned navy and emerald green double-breasted suit, with a navy and white printed shirt underneath. Shawn Mendes attends the 2018 MTV Video Music Awards at Radio City Music Hall on Aug. 20, 2018 in New York City. But their Canadian moment would not be complete without a Drake reference. "Would you rather dance to [Drake's] 'In My Feelings' or 'In My Blood?'" asked Harlow. "Probably 'In My Feelings,'" said Mendes. "But I'm not going to dance, I'm going to run away." And run away he did, because he has a big night ahead. Drake and Mendes will go head-to-head in the Best Direction category, for "God's Plan" and "In My Blood," respectively. As for Harlow, she truly excelled in her co-hosting position on the pink carpet; providing expert fashion commentary while also throwing in a laugh or two on the most fun night in music. Way to rock it!